A still from As You Are, which was filmed at many locations around the Capital Region. The special screening will be at The Spectrum March 3 at 7 pm. Tickets for the event are $20 and only available online, not through the normal Spectrum ticketing system. The event is sponsored by Film Albany and Upstate Independents, and all the proceeds will benefit the YouthFX program in Albany. The event will feature a post-screening Q&A with the Albany natives behind the film: writer/director Miles Joris-Peyrafitte, writer Madison Harrison, and producer/colorist Joseph Mastantuono. Hits -- a new film from actor/comedian/director David Cross (you know, from Arrested Development) -- will screen at the Spectrum February 19, with a live Skype Q&A with Cross following the screening. Tickets are pay what you will, and sales will be directly split between the film and the Spectrum. Splitsider describes Hits as "a darkly caustic journey into the pathetic depths of viral videos, internet fame, and the insatiable vacuum of lowest-common-denominator post-reality culture." It's the first film directed by Cross, and he's using some unusual ways to get the film out there. There will be pay-what-you-will screenings -- like the one at the Spectrum -- at < href="http://www.hitsfilm.com/">a handful of theaters around the country. And the film will also be released using BitTorrent. The pay-what-you-will screening at the Spectrum is Thursday, February 19 at 6:30 pm. The Skype Q&A with Cross will follow. The Spectrum advertises on AOA. Because we are a site on the internet we are required to post something about this -- because cats: The [deep breath] First (and Probably Last) Annual Capital Region Feline Film and Video Festival for Humans will be at The Spectrum October 7. As best we can tell, it's pretty much what's on the label. The fest is the creation of Albany native Mike Keegan, who now lives in San Francisco. He teamed up with film festival veteran Jay Wertzler to produce the First Annual San Francisco Intergalactic Film + Video Feline Festival for Humans this past May. Here's a recap of the event (we won't spoil the stunning twist involving Keegan about 2/3 of the way into the article). The duo are now taking the show on the road. Keegan reached out to us today because they'd like to include cat videos from the Capital Region in the Spectrum show -- there's info on how to submit videos at that link. The Spectrum screening starts at 7 pm on Tuesday, October 7. In related news: The cats are now one step closer to thoroughly distracting humans as they advance their plot to take over the world. 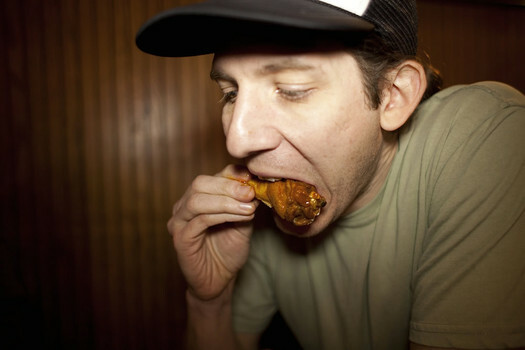 THE GREAT CHICKEN WING HUNT is an award-winning documentary comedy about Buffalo wings and the band of misfits who set out to find the world's best one. Join us for the Albany premiere of the film critics call "The Big Lebowski of documentaries" and "One of the bonafide best movies of the year". Featuring several scenes shot in Albany. Associate Producer and Albany native Melinda Person will introduce the film. Director Matt Reynolds will Skype in for a Q&A. The trailer is after the jump. And here's a review of the doc by Eater's Joshua David Stein from this past November -- he calls it "hugely enjoyable." The screening at the Spectrum is Wednesday, January 22 at 7 pm. Tickets are $10 and available online. Mike Birbiglia's Sleepwalk with Me opens at the Spectrum this Friday. The indie comedy -- from Birbiglia and the producers of This American Life (Ira Glass co-wrote the film) -- is in limited release (TAL has been urging people to request it at theaters). We know of lot of people in the AOA crowd are fans of Birbigs and TAL, so we pulled together a drawing for what should be a fun night out: two free tickets to Sleepwalk with Me at the Spectrum, plus a $25 gift certificate for dinner at the nearby Capital City Gastropub. What's your surreal dream for the Capital Region? It could be a dream as wish for the future -- "My dream is to build a new Corning Tower out of bacon" -- or an actual (sleeping) dream that you've had. We'll pick one winner at random. That person gets the tickets and the gift certificate. The tickets are good for any showing of Sleepwalk during its one-week run at the Spectrum. The story: when an aspiring stand-up fails to express his true feelings about his girlfriend and his stalled career, his anxiety comes out in increasingly funny and dangerous sleepwalking incidents. SLEEPWALK WITH ME features Lauren Ambrose ("Six Feet Under"), Carol Kane ("Taxi"), James Rebhorn ("Meet the Parents"), Cristin Milioti (star of Broadway's "Once"), plus comedians Marc Maron, Kristen Schaal, Wyatt Cenac, Jessi Klein, Henry Phillips and David Wain. The trailer is embedded above. And, due to the ultra-competitive nature of the film industry, Birbiglia and Glass have started a feud with Joss Whedon. Important: All comments must be submitted by noon on Tuesday, September 11, 2012 to be entered in the drawing. You must answer the question to be part of the drawing. One entry per person, please. You must enter a valid email address (that you check regularly) with your comment. The winner will be notified via email by 5 pm on Tuesday and must respond by noon on Wednesday (September 12). AOA is a media sponsor of the film at Spectrum. The Spectrum posted today that it will start screening Sleepwalk with Me on September 14. We hear it will run at least a week. Sleepwalk is an indie comedy from Mike Birbiglia and the producers of This American Life. The trailer is embedded above. Birbiglia and TAL have been urging fans to contact their local theaters in an effort to get the film picked up around the nation. A few weeks ago the Spectrum posted it was "getting a ton of requests" for the film. In addition to Birbiglia, Sleepwalk also stars Lauren Ambrose, Marc Maron, Kristen Schaal, Wyatt Cenac, Jesse Klein and a bunch of other comedians.